Remember Janelle Egger? You know, the Fortuna resident whose attempts to find out more about her city government's plans to build a new water tank turned into a Kafkaesque quest and public records lawsuit against the city? 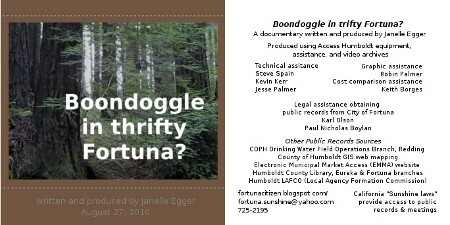 Well, with the help of Access Humboldt's citizen-production services, she's made a documentary of the saga: "Boondoggle in thrifty Fortuna?" I began in the spring of 2008 to question why the city was planning to build a water tank since we have a virtually unused city reservoir with enough storage for the entire city. After a two year investigation of public records, including a struggle to access city records, I'm still puzzled as to why we are not using the city reservoir. But I'm convinced that the reasons given to build a new tank do not hold water. Access Humboldt will air the documentary at 3:30 p.m. this Saturday, Sept. 4, and at 8:30 p.m. Sunday, Sept. 5. And there will be more airings in the future. Egger's timing is impeccable: She's running for Fortuna City Council.